There are six Ball & Gym Themes. The themes switch the first Monday of the month (the Equipment Switch Day is indicated on our gym calendar, located in the footer of the website). The themes are meant to direct the children’s ball-skill development, through focused ball activities and specific gym equipment. 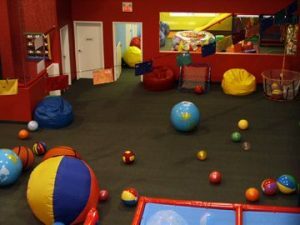 The Baby & Toddler Gym and the Big Kid Gym both experience the same ball themes. The Monthly Ball & Gym Themes are listed on the right hand side of this page. Check out our Gym Calendar for the current Ball & Gym Theme. There are many learning opportunities during each month. The gym provides concrete examples for children. Expand your child’s vocabulary and use different balls and equipment to learn sorting, ordering, matching, grouping, sizing, weight, texture, colours, numbers, and letters. Plus, words like cones, spotters, volleyball, soccer, badminton, bats, and hula hop will help your children expand their gym vocabulary. Some of the gym equipment and balls can only be played with during certain themes, as some equipment and ball combinations are not safe when played together. Plus, some equipment needs to be inspected and cleaned before being brought onto the gym floor. Please keep the gym equipment and red chairs where they are placed. They are placed according to the Ball & Gym Theme layout to allow for clear running space and ball-play room for that theme. Please use the gym equipment safely and for its proper purpose.